I have officially turned old… well, old enough to join Skydivers over Sixty. Actually, I tried to join earlier but then it was explained to me that “sixty” was age and not IQ! Upon receiving my official SOS information, badge, and secret handshake, I noticed that the state formation record for Texas was only nine people. Dang, we can beat a nine way! 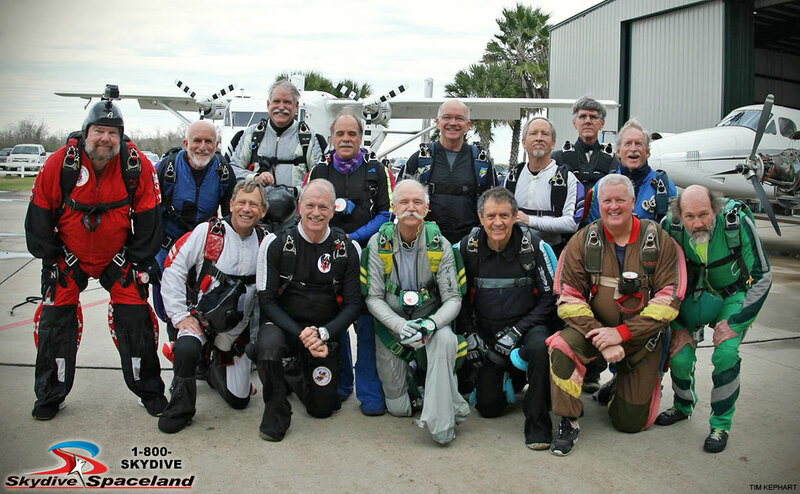 So, on December 14, 2013, at Skydive Spaceland in Rosharon, Texas, we set out to do just that. We amassed 12 jumpers who were SOS members and then set the first record. After landing, two more of our brethren showed up and we set an even bigger record of 14 in formation. We then went back up and wanted to do a sequential with the new record, but the clouds had rolled in and we only had enough altitude to do the first formation, although it was the newest record. That was the end of jumping for the day. It was not without tribulations. When asked to read the handouts for the jump, we had to take a time out so everyone could get their reading glasses. And at one time I thought we had a drug deal going down, but it turned out to be just a trade of some Flo-max for some Viagra. Damn, we’re old! Nevertheless, we are now official record holders and have vowed to set an even more impressive record soon. Preparations are already being made: Guys are getting new batteries for their pacemakers, nursing homes have agreed to keep their doors open later so we can return our jumpers and we are going to use the Skyvan next time as it is easier to roll the wheelchairs down the ramp! Stay tuned! I am impressed! Problem as I see it is when Social Security Administration sees how viable you old farts are, they are going to raise their entitlement start date to 75.